PHOENIX (AP) — Arizona’s Paul Goldschmidt hit the first pitch he saw into the second deck. He added three more hits, two more RBIs. Maybe the Diamondbacks should give him days off more often. Goldschmidt had a homer among his four hits and drove in three runs to tie a team record with his fourth straight multi-RBI game, helping the Diamondbacks roll over the San Diego Padres 9-3 on Tuesday night. “For him to step out of it, know he wasn’t going to play, he was probably able to turn off his brain for a period of time when he’s not used to turning off his mind and I think it was very refreshing for him,” Diamondbacks manager Torey Lovullo said. After nearly blowing a 7-1 lead on Monday, the Diamondbacks jumped on Clayton Richard (2-3) early and kept hitting to match the 2008 team for the franchise’s best home start at 10-2. Arizona became the first team since the 2005 Chicago White Sox to homer in the first inning in five straight games on a solo shot by Goldschmidt. Chris Owings had three RBIs, Daniel Descalso also hit a solo homer and the Diamondbacks had 16 hits to reach 10 home wins 19 games earlier than last season. Patrick Corbin (2-3) pitched well with the early lead, striking out nine in seven strong innings. He allowed two runs and eight hits, including a solo homer by Jabari Blash in the seventh inning. The Diamondbacks are the best in baseball at hitting with two outs — .283 entering Tuesday — and were at it again against Richard. Goldschmidt got a rare day off Monday and returned with a bang, hitting the first pitch over the left field foul pole into the second deck for a two-out, solo homer. Arizona scored three more runs with two outs in the second, on Owings’ two-run triple and Goldschmidt’s run-scoring single, which helped him match a team record set six times previously, last by Welington Castillo in 2016. Pollock and Owings each had run-scoring hits off Richard in the fourth inning to push Arizona’s lead to 6-1. Richard allowed six runs and nine hits in 3 2/3 innings. “Give them credit for taking advantage of my not being on my game and not having good stuff and not being able to command the zone and they ran with it,” Richard said. Corbin struck out the side in the first inning and kept piling up the strikeouts. He gave up a run-scoring single to Yangervis Solarte in the third inning and finished off the seventh after the Padres got two runners on following Blash’s homer. 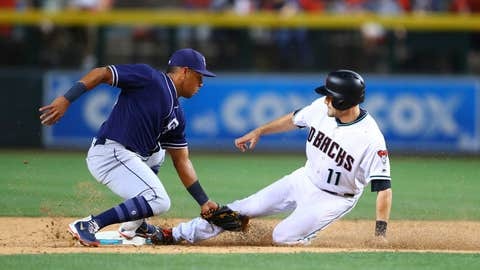 Diamondbacks reliever Silvino Bracho had a rough night on Monday, getting one out while allowing four runs as the Padres rallied from a 7-1 deficit. The right-hander bounced back nicely on Tuesday, pitching a perfect ninth inning before being sent down to Triple-A Reno to make room for Wednesday’s starter, Zack Godley. Padres center fielder Manuel Margot made a spectacular defensive play to end the second inning, laying out to snag Yasmany Tomas’ liner and rob him of extra bases. Padres: RHP Jhoulys Chacin was scheduled to have an X-ray on his left foot after fouling a ball off it against the Diamondbacks on Monday night, though he’s not expecting to miss his next turn in the rotation. Diamondbacks: Arizona shuffled its upcoming rotation while awaiting word on Shelby Miller’s forearm tightness. Godley was recalled from Triple-A Reno to start on Wednesday, with Taijuan Walker and LHP Robbie Ray following him. Padres: RHP Trevor Cahill is holding hitters to a .182 batting average heading into Wednesday’s start against the Diamondbacks, including .121 by lefties. Diamondbacks: Godley appeared in 27 games last season with the Diamondbacks, including nine starts, finishing 5-4 with a 6.39 ERA.